How do you make sure your kids are engaged at Math Centers? Why you throw some candy in there of course! 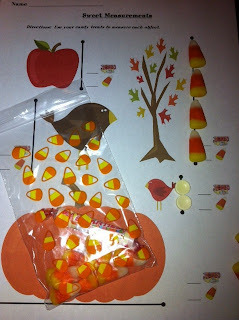 Practicing nonstandard units of measurement is as simple as grabbing some candy corn and Smarties from the dollar store and printing out this freebie! Instant center! Oh, but don't think that you can't dig deeper if it's this simple! The reason we measure each object twice with candies of different sizes is to give our students the opportunity to make the connection that the smaller the unit of measurement, the more you will need for each length! Click the picture to grab this from TPT or click here to get it from Teachers Notebook!